Late last year at the Paris Agreement, nations pledged to hold the global average temperature rise to well below 2°C above pre-industrial levels and to pursue efforts to limit the temperature rise to 1.5°C above pre-industrial levels. On 5 October 2016, the threshold for entry into force of the Paris Agreement was achieved. The Paris Agreement will formally enter into force on 4 November 2016. Meanwhile, as illustrated by above image, temperatures have been more than 1.5°C above pre-industrial levels for nine out of the past twelve months. 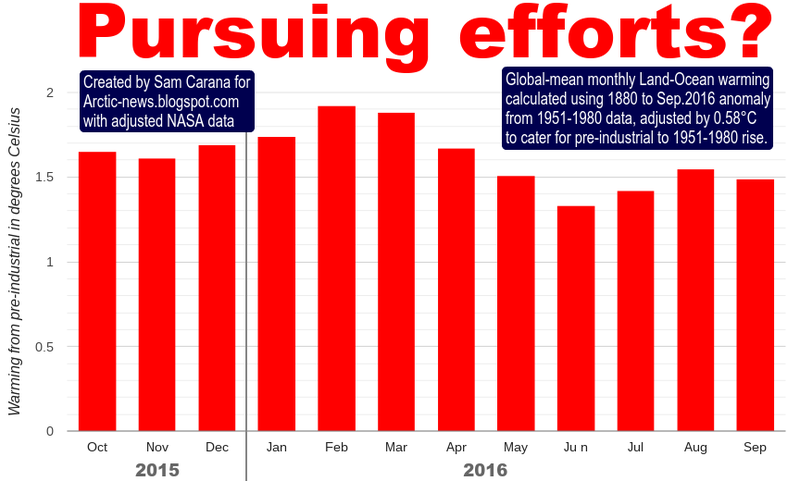 For the months February and March 2016, the anomaly was actually quite close to the 2°C guardrail, while for station-only measurements, warming for February and March 2016 was well over the 2°C guardrail from pre-industrial levels. The monthly warming in above image was calculated by using the NASA Global Monthly Mean Surface Temperature Change data (Land+Ocean) from 1880 through to September 2016, while adding 0.28°C to cater for the rise from 1900 to 1951-1980, and additionally adding 0.3°C to cater for the rise from pre-industrial to 1900. The 0.28°C adjustment (to cater for the rise from 1900 to 1951-1980) is illustrated by above graph, which has a polynomial trend added to the NASA Global Monthly Mean Surface Temperature Change (Land+Ocean) data from January 1880 through to September 2016. As said, the top image has a further 0.3°C added to cater for the rise from pre-industrial to 1900, as discussed in an earlier post. 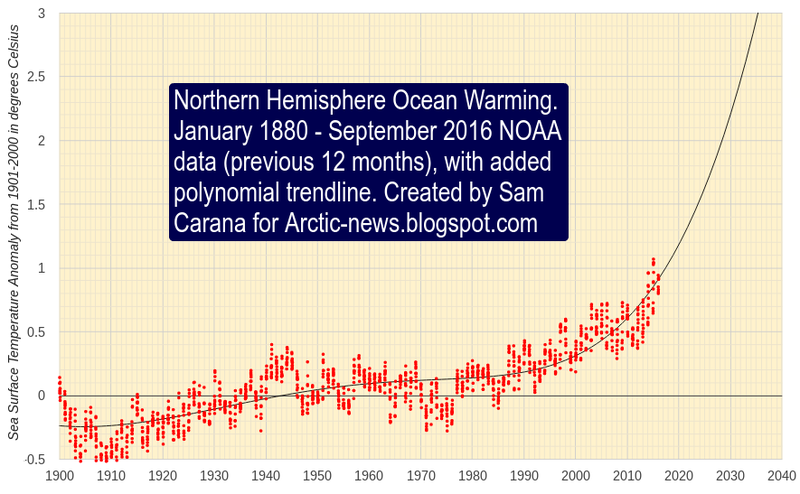 Above image shows sea surface temperature anomalies on the Northern Hemisphere, with a polynomial trend pointing at a doubling of ocean warming within one decade. Warming of the sea surface on the Northern Hemisphere threatens to speed up Arctic sea ice loss, as the Gulf Stream pushes ever warmer water toward the Arctic Ocean. In addition, warming of the air over the Arctic Ocean occurs faster than elsewhere on Earth, as illustrated by above image and by the animation on the right. This further speeds up the demise of the snow and ice cover, as illustrated by the images below. 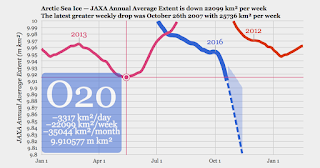 Arctic sea ice extent on October 20, 2016, was at a record low for the time of the year, at only 6.15 million square km, as measured by the National Institute of Polar Research in Japan. 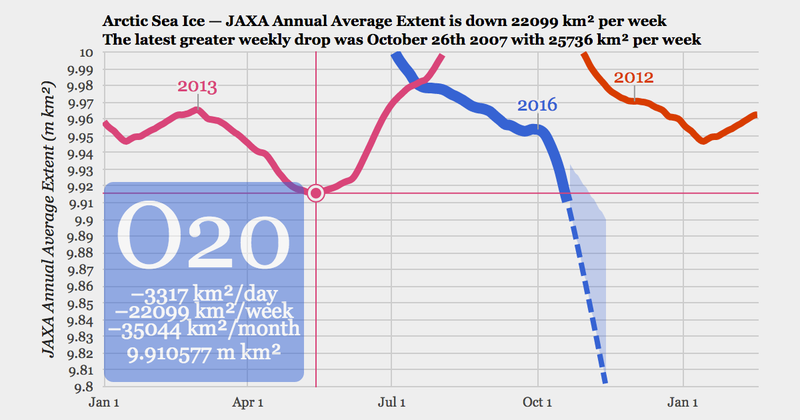 The images below show Arctic sea ice extent as measured by NSIDC.org (left) and average Arctic sea ice extent (year to date, October 20, 2016), from a post by Torstein Viðdalr (right). 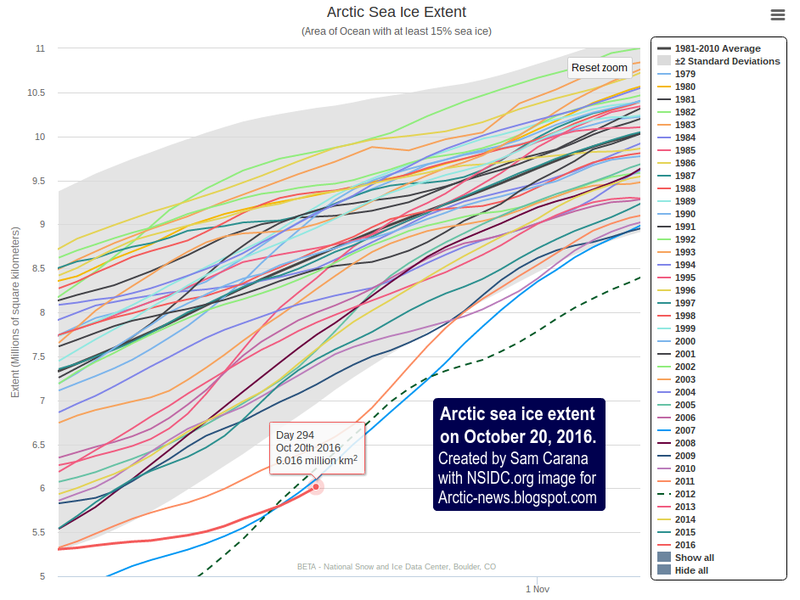 Average Arctic sea ice extent for the period October 22, 2015 to October 20, 2016 (blue line) was lower than it was for any other 365-day period since 1978, when satellites first started measuring sea ice extent. The images below show Arctic sea ice thickness as measured by the National Institute of Polar Research in Japan (left) and as measured by the Naval Research Laboratory (right, new model). 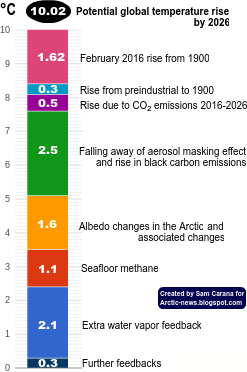 The rapid growth of the sea ice has stopped because during the summer the surrounding ocean accumulated so much heat that it cannot yet freeze. Whilst the central Arctic Ocean around the North Pole saw a very rapid freezing as its broken sea ice cover quickly fused together in cold, autumn darkness breaking new records, it now has suddenly hit the opposite: a new all time record low for sea ice area for this time of season. 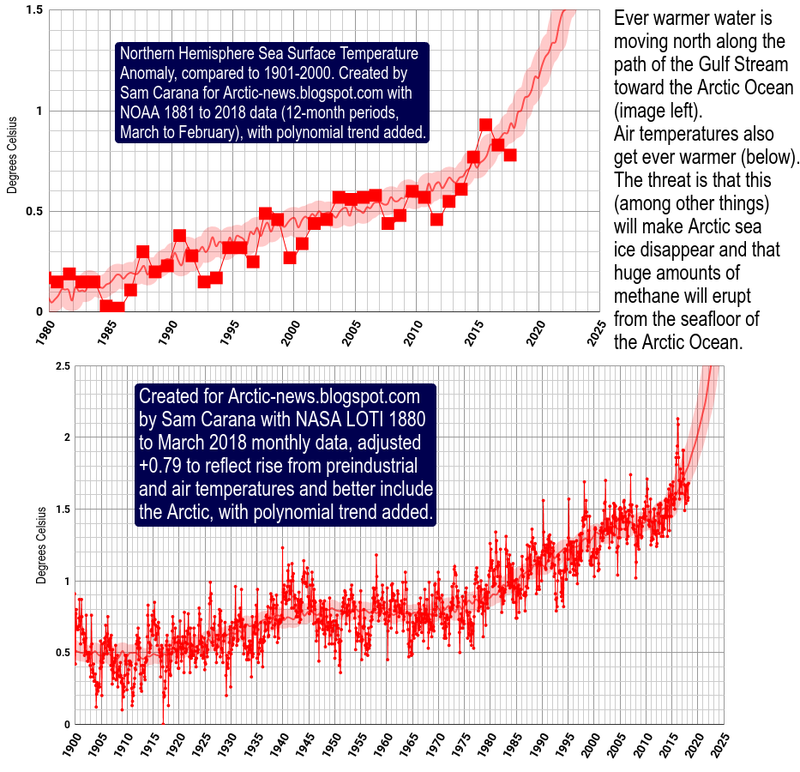 This is because the ocean is still too warm for water to freeze around edges of the Arctic Ocean leading to all-time record low ice area that fell below or is at least in par with year 2012 low (the last record low ice year). The image below (Arctic on the left, Antarctic on the right) was created by Daniel Kieve. 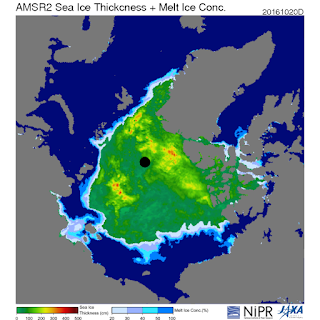 Both Arctic and Antarctic sea ice are now at record low extent for this time of year according to NSIDC data, with the Arctic sea ice over 2 million square kilometres lower than the average extent for 20th October. The Antarctic sea ice is at 2 standard deviations below the (30 year) average. At this time of year it's usually a time of rapid ice growth in the Arctic but it's stalled due to the continuance of anomalously warm air in parts of the Arctic and in particular the record warmth in the oceans that is encroaching more and more into the Arctic. This means next Summer the Arctic ice is more vulnerable than ever to collapse as the insolation reaches its peak in June and July. 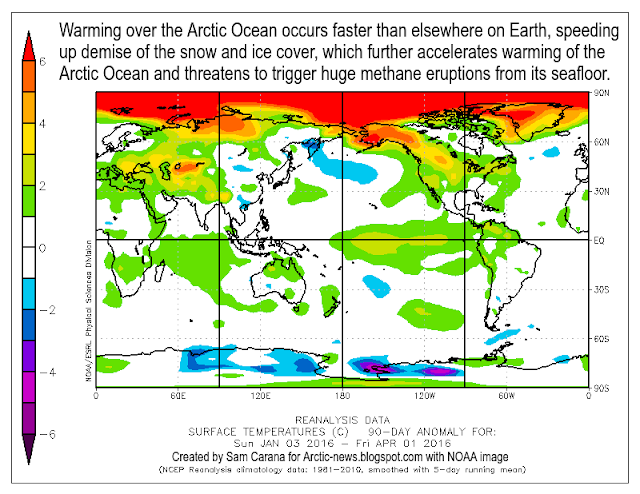 Demise of the snow and ice cover in the Arctic further accelerates warming of the Arctic Ocean in a number of ways. Decline of sea ice extent makes that less sunlight gets reflected back into space and instead gets absorbed by the Arctic Ocean. Similarly, the decline of the snow and ice cover on land in the Arctic makes that more sunlight gets absorbed on land, which in turn make that warmer water from rivers flows into the Arctic Ocean. For more feedbacks, see the feedbacks page. There's a growing danger is that further warming of the Arctic Ocean will trigger huge eruptions of methane from its seafloor. 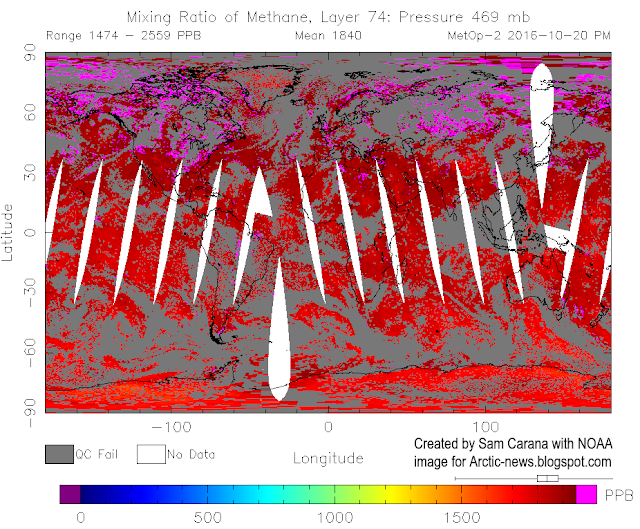 Ominously, on October 20, 2016, methane levels were as high as 2559 parts per billion, as illustrated by the image below, which also shows high methane levels over large parts of the Arctic Ocean. 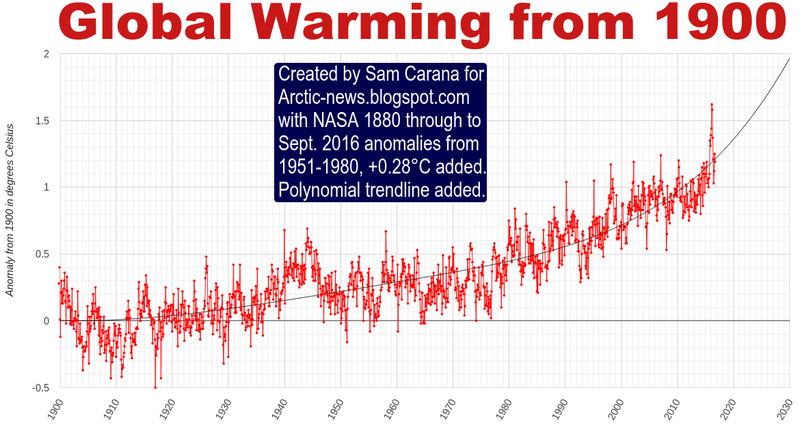 The temperature rise resulting from such feedbacks has the potential to cause in mass extinctions (including humans) and destruction over the coming decade, as discussed at the extinction page. I would opt to disagree with David Hume in this case. Deep Ecology (Arne Næss) is after all about taking the current status and DOING something about it. Yet the collapse of politics is maybe more complete today than even the Arctic sea ice collapse? Since the 1880s judicial systems have been satisfied with someone being a *suspect*, and that's been sufficient for giving them the death sentence. Even though they weren't even in town when a crime was committed in that town. Since the 1890s we've been aware of the CO2–driven greenhouse effect, yet still in 2016 we're satisfied when our so–called leaders make empty promises. We know the state of the climate systems per October 2016, yet nothing of any significance is done. They're rather treating it as a public relations problem (how can we calm people down). To me, therefore, this seems like a latter–day extreme repeat of the Is–Ought "problem" philosopher Hume wrote down. At least the military tradition has a "Do or Die" ethic, that seems infinitely more appropriate. Why, in your discussion of a 2° C increase limit, don’t you recognize this 2015 statement by Dr. David Wasdell (http://www.apollo-gaia.org/Harsh%20Realities.pdf, p. 15): “An increase of 1.5°C was implicit by around 1965. 2°C was implicit by about1978. So 2°C was already in the pipeline towards the end of the 1970s. Today we are under the illusion that reducing our emissions will still keep us under 2°C!”? The fact that John B. Davies stated on your site in 2013 that “The world is probably at the start of a runaway Greenhouse Event which will end most human life on Earth before 2040” is CONSISTENT with Wasdell’s statement . . . .